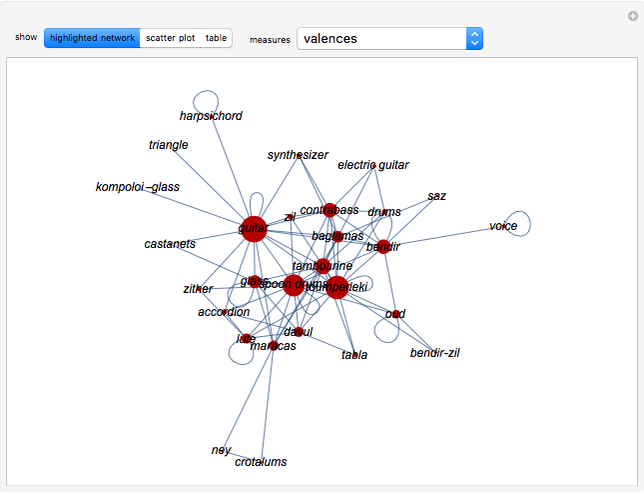 This Demonstration plots a network encoding musical instruments used for rhythm accompaniment. The data consists of 100 recordings of 21 popular songs of Smyrna in nine-beat rhythms. You can choose various measures. The results are also presented in tables and scatter plots. The following musical instruments used for rhythm accompaniment were considered: guitar, toumperleki, spoon drums, bendir, baglamas, contrabass, oud, harpsichord, glass, zil, tambourine, lute, maracas, davul, saz, zither, bendir with zil (bendir-zil), drums, castanets, accordion, kompoloi with a glass (kompoloi-glass), synthesizer, tabla, crotalums, ney, electric guitar, and triangle, as well as the voice. The network encodes the use of these musical instruments in the recordings, either alone or in combination. 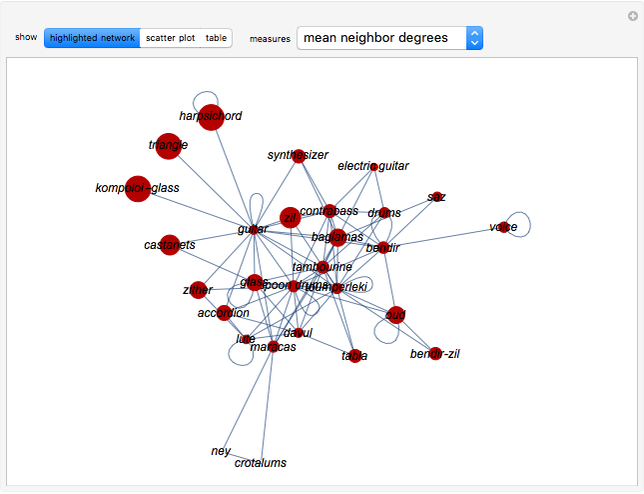 Each vertex of the network represents an instrument. If an instrument was used alone, it is connected to itself with a loop. If it was used in combination with any other instruments, it is connected to each of them with an edge. 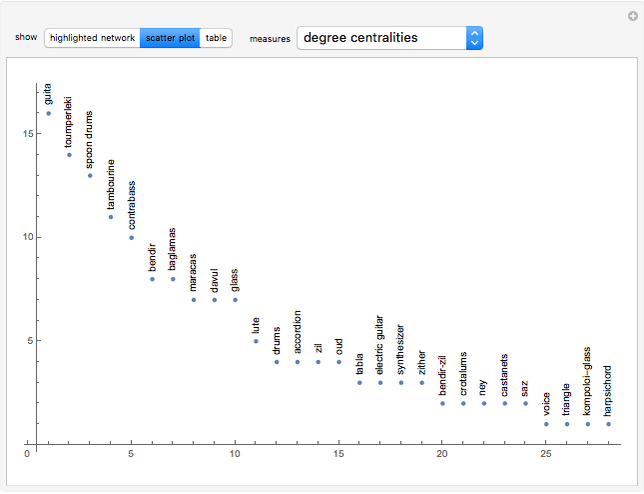 The network is weighted. The weight of each loop or edge is the frequency of use for each instrument or combination of instruments in the recordings. The surface of each highlighted vertex is proportional to its respective measure. The calculated measures are the valences, the mean neighbor degrees, the degree centralities, the betweenness centralities, the closeness centralities, the eigenvector centralities and the page ranks. As far as we know, this Demonstration presents a novel method for studying the characteristics of musical instruments. C. Chatzimichail, "The Popular Songs of Smyrna in Nine Beat Rhythms Before and After the Destruction of Smyrna," thesis, Department of Traditional Music, Technological Educational Institute of Epirus, Greece, 2017. doi:10.17605/OSF.IO/WEK3Q. Chrysavgi Chatzimichail and Aristides T. Hatjimihail (Aristeidis T. Chatzimichail) "Network of Musical Instruments for Rhythm Accompaniment "